There was once a point in my life when I was addicted to little scraps of cardboard. They held the power to move stars, summon demons, smite my enemies, and stymie the most panic-inducing enemy advance. They were powered by the energy of land - mountains, plains, forests, islands, swamps - and they invoked equal parts fear and wonder from my opponents. They were beautifully illustrated and I would slide them delicately into plastic sleeves and package them reverently into hard cases. Yes friends, there was a time when Magic: The Gathering ruled my life. But like all addictions, I had to step away for the good of my health (and bank account!). You may ask, "Donny, how have you been able to cope with such a dramatic change in your life?" And I would say to you, "Reader, one word: Seasons." That's right, Seasons! A board game called Seasons, design by Régis Bonnessée, published in the US by Asmodee, took me by the hand and led me down a path I didn't know existed. I could scratch many of the same itches brought on by Magic, but with a board game! I was mystified and stunned to the point of disbelief. And I'll tell you why. 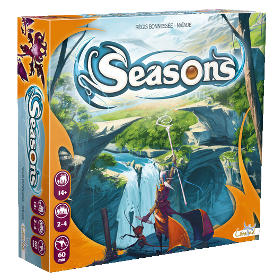 Seasons is a board game focused around one of my favorite mechanics in all of gamedom - drafting! Whether its in 7 Wonders, Magic: The Gathering, or a host of other games, I love to draft. For the uninitiated, drafting is a process in which everyone at the table is given an equal number of something (in this case cards) and they select one. This card goes face down in front of them and they pass the remaining cards to the left (sometimes right, but as long as its all the same direction, it works). In doing so, you receive another hand of cards from the person on your right and repeat the process. This is repeated until there are no more cards to select. You have drafted a deck for your own personal use in the game. How does this work in Seasons? I'm glad you asked! Each player in Seasons is a wizard competing in a tournament to be the best wizard in the Kingdom of Xidit. This tournament takes place across three years and you use the magic of each season (get it? Seasons?) to power your familiars and magical items, represented by power cards. Over the span of the three years, moving through winter, spring, summer, and autumn, players will roll and select dice to acquire energy tokens and crystals and use them as resources to play cards. These cards will have a victory point value on them. At the end of the game, players count up victory points on their cards and add them to the number of crystals they have to get their final score. The highest scorer is the winner. Energy on the dice is represented by a symbol associated with the various seasons. The drop of water is winter, the sapling is spring, the flame is summer, and the feather is autumn. When you pick a die with one or more of these symbols, you take that many energy tokens from the supply and add it to your reserve. When you see a number, wherever it appears on the die, it means you get that many crystals. A star on the die means you can increase your summoning gauge by one. The number on your summoning gauge is the maximum number of cards you can have in play. Sometimes there is a circle around all your symbols. This means you have the ability to transmute energy tokens in your reserve into crystals. Finally, some dice have a side with a rectangle. Selecting this die allows you to draw a power card from the deck and add it to your hand. This can be very useful for playing more than the nine cards you drafted in The Prelude. Each player will have their own player board. This board includes your summoning gauge, your energy reserve and some special powers you have access to over the course of the game. Each player is initially limited to seven energy tokens. The summoning gauge tops out at fifteen. I'll skip explaining the special powers for now but they make for some interesting decisions as you play. The game board is the focal point of the play area. It is divided into a center and four rings. Each ring is divided into four slices. The center of the board tracks the year the players are in. The outermost ring tracks the passing seasons using a cube. Each season has three numbers, representing months: 1-3 is winter, 4-6 is spring, 7-9 is summer and 10-12 is autumn. At the end of each round of play, players will check the die that was not selected (did you remember to roll more than one per player?) for the number of small pips on it. This indicates how many numbers forward the season cube moves. It might only move one month forward and stay in the same season. It might leap forward three months and jump into a brand new season which means new dice and different energy! 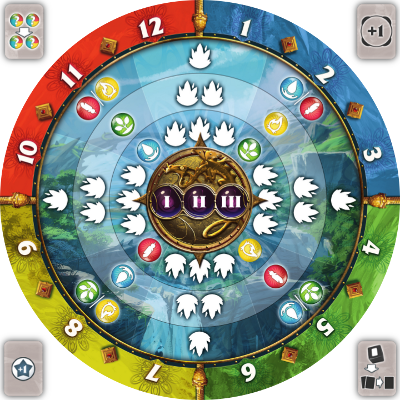 The inner three rings on the game board are used for transmuting and also indicate how common certain types of energy are in any given season. The energy on the ring closest to the outer ring is the most abundant on the dice of that season but gives the least crystals when transmuted. The energy on the central ring is less likely to appear but worth more crystals. The energy on the ring closest to the year tracker does not appear on dice of that season but is worth three crystals when transmuted! This crystal tracker is very simple - you track your crystals with it! This is where the magic happens. Without going into too much detail (there are a lot of power cards in the game) power cards fall into three categories: immediate effect, permanent effect, activation effect. A card with a downward pointing arrow means you gain the affect of that card immediately. It could be more crystals or drawing a card. Once its played, an immediate effect card doesn't do anything else but does provide victory points at the end of the game. A permanent effect is something that stays out and provides a persistent benefit for the rest of the game. This could include gaining an additional energy token in certain seasons or increasing your energy reserve. An activation effect is a power on a card you must activate to to gain the benefit. When you do so, you simply turn the card (or "tap" as we say in the biz) to indicate its been used and carry out the effect. At the start of your next turn, you'll "untap" it to show its usable again. Power cards can also have any combination of these abilities. The first phase of Seasons is called The Prelude and this is where you shape a lot of how the game plays out. Each player gets nine cards. These cards are either magical items (purple cards) or familiars (orange cards). Players will draft (see above), until they have nine cards. Each player will then divide these cards into three piles - one for each year. Years two and three go under tokens and cannot be used until that part of the game. Year one forms your starting hand. From here, we enter phase two: The Tournament! Each season is represented by colored dice - blue for winter, green for spring, yellow for summer and red for autumn. The starting player will roll the dice (one more than the number of players) for whatever season the players are in. Beginning with the starting player, players will each pick one die in turn order. The upward face of the die tells you what things you will get for that round. This will be any combination of the items listed above in "Iconography of Seasons". Once each player has a die, play will progress in turn order with each player taking what they get for their die and playing as many cards from their hand as they want to. To play a card, look just below the picture - you will see energy symbols or the small black crystal symbol with a number. This is the cost to play a card. Just pay the correct tokens or reduce your crystal count appropriately. Once all players are done, the player to the left of the first player becomes the new first player and the round will start again. This game is incredibly colorful. Unicorn vomit colorful. The strong primary colors of the seasons is juxtaposed to the player color options - gray, orange, purple and lime. The board is awash in color as are the cards. This isn't a complaint by any means. Just a "so you're aware" statement. There's a lot of color... The art on the cards is great as well. Its a lighthearted aesthetic that suits the color palette. Seasons is one of those games that can suit many different kinds of gamers. It can easily be played as a casual, one-off game. At the same time though, for those who want to, there is an uncanny amount of depth that comes with many engine building games. If someone really wanted to, they could play this game on a much deeper level when accompanied by like-minded players. Seasons plays great with three players. I really enjoy it with two, as well. There are some interactive cards that you may consider removing for a two player game but with two its super quick and still lots of fun. Once you hit four though, the game begins to drag. I would recommend, when playing with four, stick to experienced players only. Four casual or learning players can make for a very long game and a negative experience for everyone involved. My rule of thumb is to keep learning games at two, casual games at two to three, and experienced games at any number. Well, I think I've been pretty clear on my thoughts about Seasons but in case there's any doubt, let me say it now - I love Seasons. This game has some amazing mechanics and some serious power in it. You get to shape your strategy through drafting - both cards and dice. On top of that, the drafting allows you to do my second favorite mechanic in all of gamedom - engine building! Engine building is where you use your cards in tandem to do super powerful things together that wouldn't be possible alone. Again, a strategy rewarded by early planning. The more familiar you are with the cards in the game, the more it rewards you for planning ahead but doesn't punish you if you don't. Now that you have an idea of how it plays, ditch the card board crack and pick up those dice! Get rolling to a table and play some Seasons. Donny is a music educator in the suburbs of Dallas. He has an obsession with all things Star Wars and, when asked what he wants to do, will always respond with "board games". You can find him at Nerd Night events in the Dallas area, Dallas Games Marathon, and often at his second home, Madness Games & Comics. He spends far too much time on social media, be it Facebook or Twitter, and comments or suggestions can be directed to kelann08@gmail.com.